Coconut flour is made from coconut, a by product of coconut milk. The coconut meat left over from making coconut milk is dried and then ground into a soft powder which can be used for baking. Its biggest benefit is that is gluten free and grain free so for those who are not able to tolerate most grains it is a wonderful alternative. It is high in fiber which also is filling. It can be irritating to someone whose gut bacteria are not in good balance because of the high fiber. But it will not cause the problems that grain does because coconut flour is not a grain. It is high in fatty acids, especially lauric acid which is a saturated fat that is thought to be good for the immune system, the thyroid and the skin. Coconut flour is an exceptionally good source of manganese which helps you to better utilize many nutrients including choline and biotin (found in eggs), vitamin C and thiamin. It is helpful for blood sugar control because it does not have much carbohydrate but is high in protein and fiber. It is high in natural sugars so does not need much if any sugar added when baking. It can be a difficult flour to get used to as it bakes up differently than others. My first experience with coconut flour was not positive as the cake I made came out very dry and unappealing. It MUST HAVE EGGS. Eggs lift the flour and act as a binding agent. 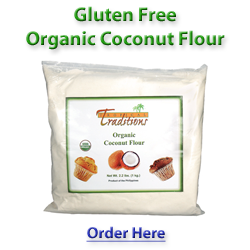 Coconut flour is also very absorbent and can absorb up to 3x more liquid than other flours. But when put in the oven it will stop absorbing liquid and so then the eggs will take care of that problem. The eggs lift and bind and also absorb any liquid that the flour does not. If not using eggs than you must use starch, as it will act as an egg substitute. It works well with almond flour. And it does not work well with yeast. My favorite recipe for coconut flour are for Blueberry Coconut Flour pancakes from Real Sustenance. The first time my husband ate these he told me they were the best pancakes he ever had. Since then we eat these at least once a month or more at our house. I buy my coconut flour from Tropical Traditions, a company I really like doing business with. They have very nice quality coconut flour (as well as shredded coconut and coconut oil and all other things coconut). You can order from them here or click on the image below. Or you can order through Amazon. So have you tried baking with coconut flour? What was your experience? Please share in the comments. We love to hear from our readers.